For students enrolled in Fixed Income Securities Courses or Bond Markets Courses. 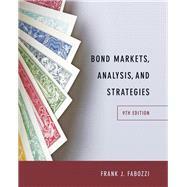 Fabozzi's Bond Markets, Analysis and Strategies offers students practical advice for analyzing bonds and proven portfolio strategies for achieving client objectives. Using an applied approach, Bond Markets helps students quickly grasp and apply key concepts without getting bogged down in theory. The Ninth Edition of Bond Markets introduces students to the state-of-the-art analytical tools and management strategies currently used by financial industry leaders, and uses real-world examples to engage students and help them achieve a deeper understanding of the complex information presented.